We're in the homestretch of our look into the typical daily/weekly/monthly life of Team Evotri. So far, we've had Sarah, Sara, Michelle, JP, Charlie. Chris, Simply Stu and Tracy. Now Matt shows us what it's like to balance training and travel. My weeks start out bright and early Monday morning with a 4:30am wake up call. Unlike the typical triathlete early wake-up call which is followed by a masters swim or group run, my wake-up call is followed by a trip to the airport. I work for Terex (a diversified global manufacturer of heavy equipment for a variety of industries such as Materials Processing, Construction, & Aerial Work Platforms) as an IT Business Analyst, and the current project they have me on requires me to travel to Memphis nearly 80% of my time. Upon landing in Memphis, I shoot over to the car rental facility, pick up a slick ride (I like to go for the sports car convertibles such as the new mustangs, Chrysler 200’s, or the occasional Suburban if I have my bike with me) and blaze into the office. The hours are long and monotonous, but the people I work with help make the days go by. After a long day of travel and work I will usually head to the hotel, check in, unpack my bags, and either go out for an easy run, or hit the pool for a swim. I am a member at 24 hr fitness in Dallas, and luckily there is a 24 hr fitness in Memphis about 20 miles from my hotel, so I don't have to pay to go swim which is a bonus. The only drawback is that 20 miles is just far enough away to contemplate and convince yourself of not going, but at the same time close enough to keep your mind on the fence. I usually fall to the right side of the fence and get the swim in, and always feel better about myself for it afterward. After a very long day, I usually hit up a nice restaurant close to the hotel, sit at the bar alone, get a nice big steak and throw back a few brews while watching sports. A nice relaxing way to end a long and jam packed day. The thing about business travel that people don't realize is that it’s actually really nice if you do it in moderation. Getting all the flights, rental cars, hotel stays, meals, etc. paid for is a major perk to the job. Racking up all those points, getting free personal trips, earning status, those are nice benefits indeed, but the overlooked piece is that if you are travelling as much as I am, those things get old quick. Living out of a suitcase week in and week out is miserable. Not having flexibility in what you can do throughout the week is mentally draining. And worst of all, my training schedule is compressed massively when I travel because I only have small windows of free time. Having to be at work from 7:30-5:30 every day, sometimes team dinners afterward, only leaves me with a few windows to get workouts in. And as you will see throughout my write up, I have to be very disciplined in order to be successful as both an employer and an athlete outside of work. Tuesday morning alarm goes off around 5am and I dread crawling out of bed, but know in order to do everything I want that day I need to sacrifice the extra hour and a half of sleep. I usually get up and go for the opposite of what I did Monday night. So hit the pool if I went for a run Monday night, or vice-a-versa. Going for a run really kind of blows in Memphis because there are no good routes. There are some neighborhoods that I go through, but I find myself repeating common routes multiple times throughout the run/week and that gets old quick. After finishing up the morning workout I hit the shower, grab some breakfast, and head into the office. The morning drags along, analyzing spreadsheets, testing bugs in the system, etc. But like I said above the guys I work with sure ease the monotony of the job, and before I know it its lunch time. For lunch we usually go out as a group and hit up local dine ins. Or if we have worn out our welcome at those establishments we hit up a chain. Eating out every day for every meal is definitely a bonus and I never go hungry, but it pays a toll on the midsection. After about 3 months of travelling I started to find myself blossoming a nice muffin top. I didn't ever think that with how much I work out I would be affected by eating too much or eating too much of the wrong food, but I was mistaken. So now when we go out I try to mix in some healthy colorful food from time to time to please my system. As the day wraps up Tuesday and we head back to the hotel. I will usually get in a bike while watching TV in my hotel room. Andy will feed me some brutal intervals and I will suffer, but again will relish the pain and know that it is going to pay off big time in the long run. Riding on the trainer in a hotel room is the worst, but knowing I have a nice gourmet meal awaiting me once I get through the workout always help speed up the hands on the clock. This is not the customary activity every week, but occasionally a few co-workers and I will pack up in the rental car and hit the casino. There is a bundle of casinos about 20 minutes south of the hotel in Mississippi, and it’s always a good time to go get a free buffet, throw back some beers, and kick it with some funny old guys. Early on in my trips I was killing it, taking home $100-200 each visit, but the last 2 times I have lost $100 and had to go home empty handed. I guess that's why they say the casino wins in the end! Wednesday morning is usually a sleep in day if I went to the casino the previous night, or a nice easy 30 min run if there was no casino fun. There is just something about a nice easy run in the cold air in the morning that I love and take advantage of every time I can. After another long day of work, and a calorie packed BBQ lunch, its back to the hotel to get in another workout!! Wednesdays tend to be another bike workout. Again Andy will feed me something treacherous to try to make me cry, and normally come very close to it! It’s painful, but in the long run very worth it. So after the bike and hitting the powder room, its out for the night with the boys. Wednesday nights are “Bike Night” on Beale Street in downtown Memphis. 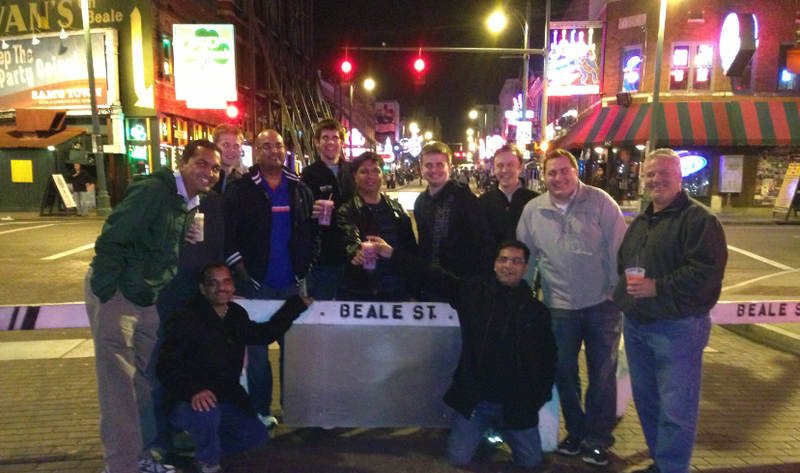 For those unfamiliar with Beale Street, it is very similar but smaller scale to Bourbon street in New Orleans. 4 blocks of police monitored and sectioned off from vehicle traffic. You can buy a pint from one bar, walk outside and up and down the street, and even enter another establishment with it. They also have an alcoholic slurpee place called Wet Willies (my favorite) that has over 20 flavors. These beverages are very potent and you can only get away with consuming 2 before things get blurry. After filling our veins with liquid courage at Wet Willies we usually end up at a karaoke bar where each of us tries our luck at becoming the next big thing. Bike Night on Beale St.
Friday morning comes around, and it's a nice sleep in, usually wake up around 7, shower up and hit the office. The Dallas office is very relaxed and people come and go as they please…its more of a get your work done and the hours are irrelevant atmosphere. So I tend to get in just before 8, and get out by 1. After leaving work I will hit the local 24 hr fitness for another swim, before again being consumed by my couch. The other main drawback of being on the road travelling constantly is that I don't have any food in my pantry or fridge. Since I’m gone 5 out of 7 days a week it doesn't make sense to go to the grocery store, so I always seem to be hungry! Friday nights are usually spent with my lovely girlfriend Iris. We just relax and hang out on the couch, watch some super magnified TV (70” is the real deal!) and fade in and out of consciousness. After the long ride, Iris and I will again spend some more time together, if it’s nice out we will sit by the pool and get some sun (we have thick northern skin both being from Michigan, so if its 60+ and sunny we are usually at the pool). If the weather isn’t so nice we will usually hit up a pub and get lunch and a few pints before settling back into the couch for the rest of the night, pretty exciting life we live together! As much as the monotony of traveling wears on me, I really do like doing what I do. I wouldn't do all my workouts at the worst hours of the day & put my body through punishing pain day after day if I didn't like it. I love being a triathlete, I love training, and best of all I love seeing the hard work paying off in races. If it weren’t for the little things like that I don't know what would keep me motivated. But I definitely am! Every day I wake up motivated to go one step farther, race 1 second faster, put in that one extra hundred in the pool. And that's why I continue to do what I do. It’s for the Love of the Game!